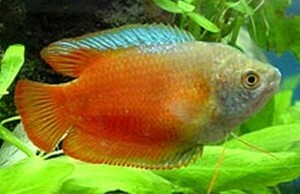 Tag Archive | "Tropical Fish Keeping – Gourami"
The Gourami family (Osphronemidae) of freshwater labyrinth fishes are common throughout Asia, from Pakistan and India to the Malay Archipelago and northeast toward Korea however, the Gourami name is also used by tropical fish keeping enthusiasts to identify fish of the Anabantidae and Helostomatidae families which are also found in south Africa. In addition to being a popular ornamental fish, Gourami are also an important food source in their native countries. Because of their size and tender flesh, Giant Gourami in particular are farmed in Thailand and other Southeast Asian countries and are highly prized as a food fish. The Climbing Perch, Kissing Gourami, Snakeskin Gourami, and other labyrinth fish of the Trichogaster genus that are common in the aquarium trade are also a source of protein and a local food fish in Southeast Asia where they are salted and dried. 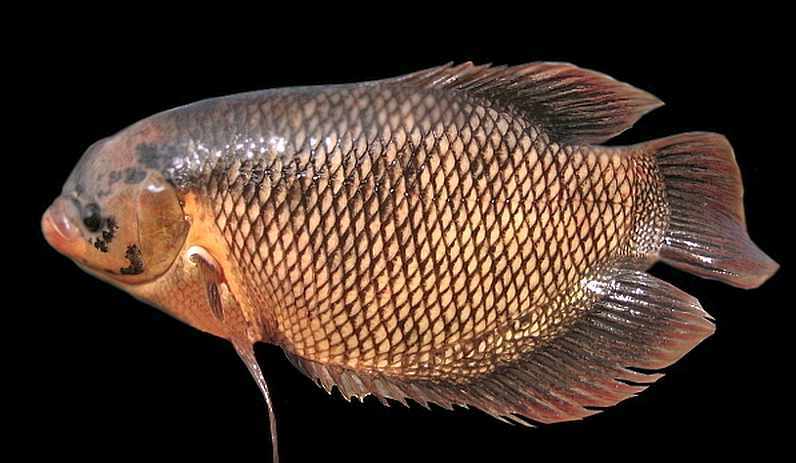 All Gourami species have a specialized labyrinth organ that allows them to gulp atmospheric oxygen to survive in the shallow, warm, oxygen depleted waters that they are frequently found in. 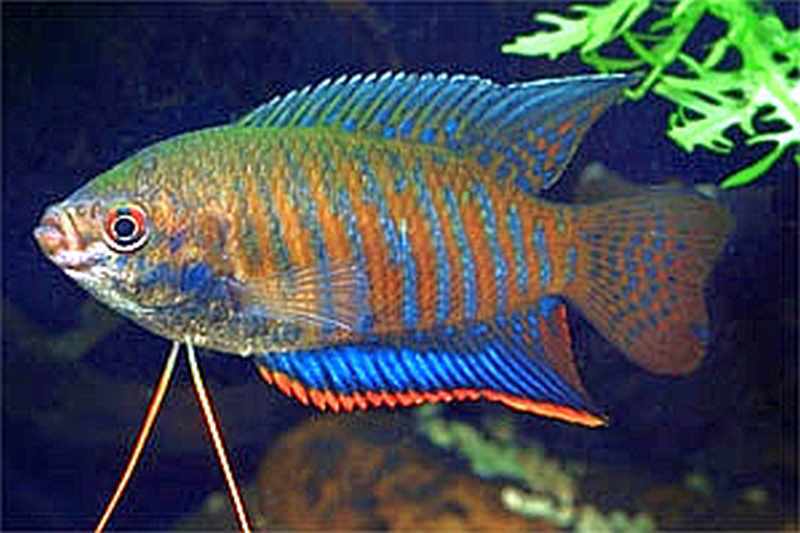 Most Gourami species are active during the daytime hours, but several African species feed at twilight and are nocturnal in nature. 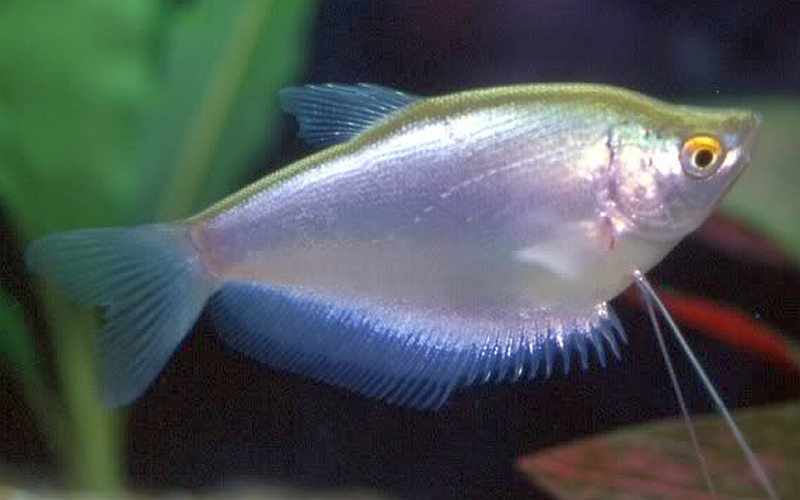 Many Gourami have elongated feeler like rays at the front of each of their pelvic fins which they use to “touch” and “feel” their surroundings. Most Gourami species show some form of parental care and some are mouth brooders. 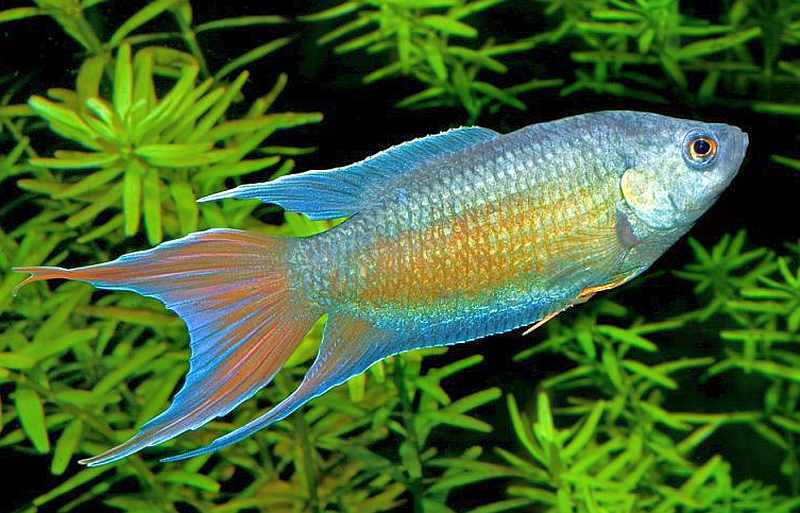 The common Paradise Fish , Siamese Fighting Fish (Betta splendens), and others build bubble nests to protect their young, and of the 133 recognized species of Gourami, almost all of them make interesting, colorful additions to a peaceful community aquarium. In an aquarium environment, Gourami will generally swim near the top of the tank. Most species are peaceful and relatively slow moving but are still capable of harassing or picking to death other long finned or smaller fish. 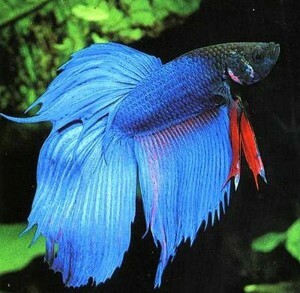 Some like the Siamese Fighting Fish must be kept in a single species tank or alone in a large community tank. Two male Bettas cannot be kept together in the same tank and even females should be removed for their safety after breeding. 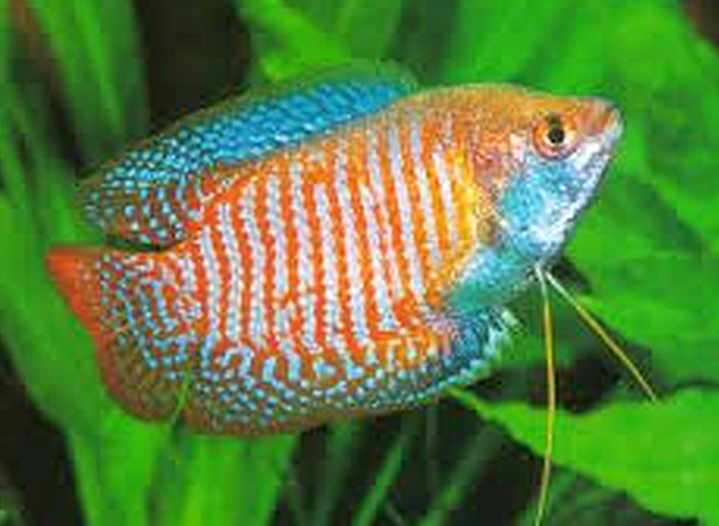 Dwarf Gourami, Three Spot Gourami, and Kissing Gourami are probably the most popular with tropical fish keeping enthusiasts and their beautiful colors, stately mannerisms and interesting antics are sure to keep you entertained. 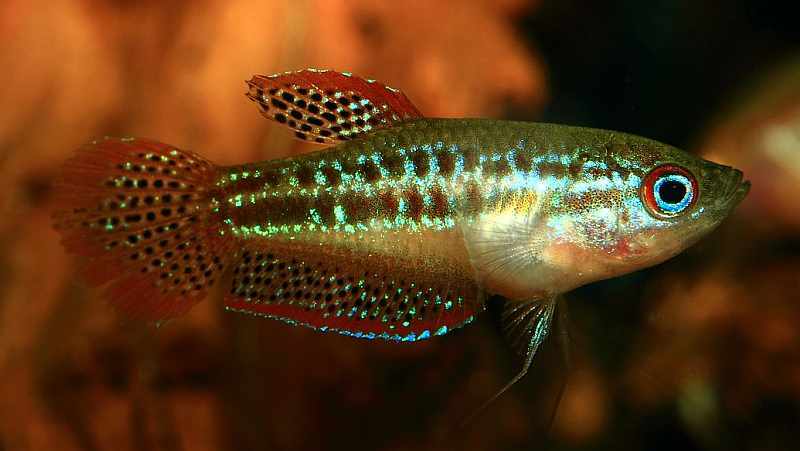 Like the well known Archer Fish, some species of the genus Colisa can even spit water to down insects onto the waters surface. 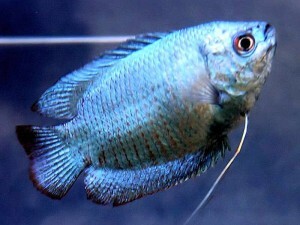 Gourami come in wide range of sizes. 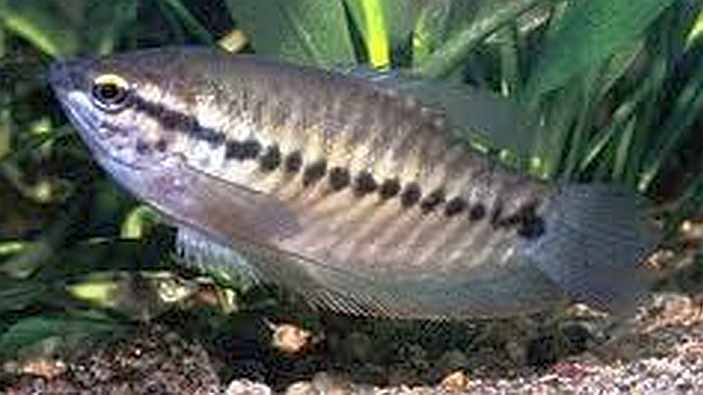 The Talking Gourami (Trichopsis vittatus) which only grows to about 2″ in length is a perfect candidate for small community aquariums. 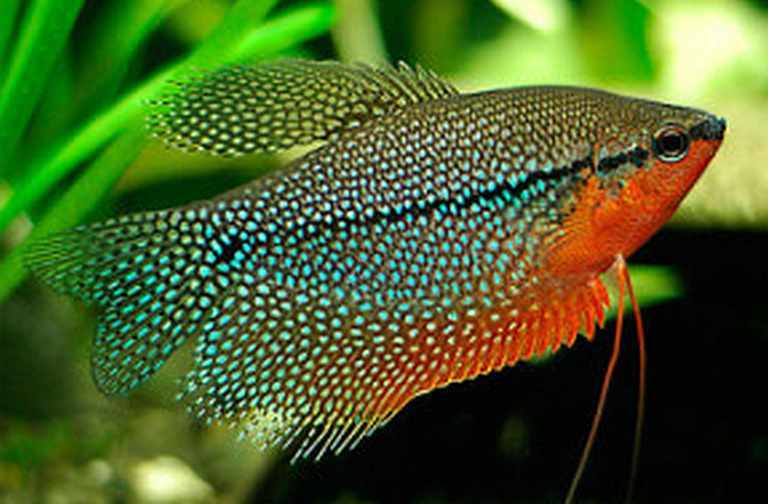 The scarcer Sparkling Gourami (Trichopsis pumilus) is beautifully colored, easy to keep, and another great candidate for smaller aquariums. 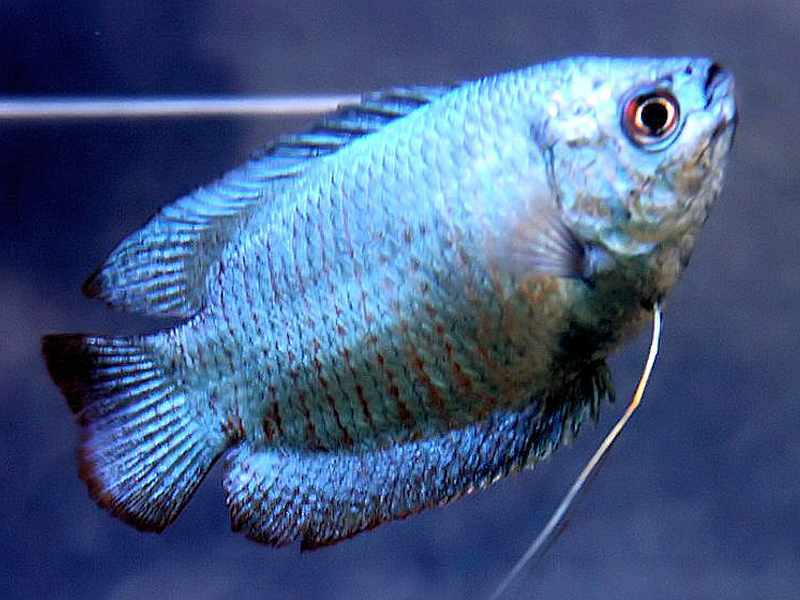 On the other side of the spectrum, the Giant Gourami (Osphronemus goramy) which is often utilized as a food fish, can grow to a maximum length of 29″, while the silvery green celestial Moonlight Gourami (Trichogaster microlepis) with it’s threadlike ventral fins, typically grows to about 6″ in length and makes an awesome addition to larger community tanks. 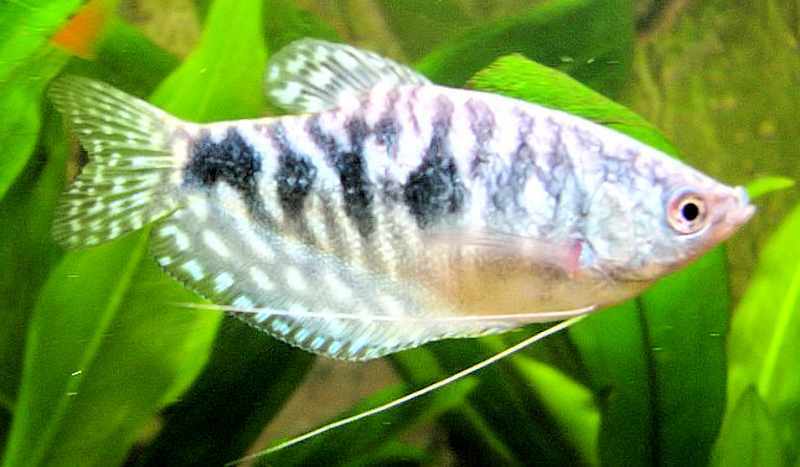 Generally speaking, most Gourami can be housed with species such as danios, mollies, silver dollars, Corydoras, loaches, and plecostomus catfish, however they are often aggressive toward species that have long flowing fins like goldfish, male guppies, and Bettas. 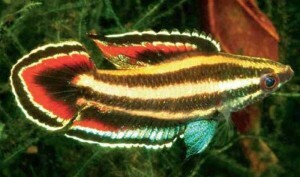 Adult and juvenile males will sometimes spar with each other, especially during breeding, but aggression can be held to a minimum by providing a large densely planted tank with delineated territories. Overcrowding is usually the primary cause for aggression in any species. Although Gourami are hardy and tolerant of water conditions that would normally kill other aquarium species, they do best in an adequately sized, densely planted aquarium with some driftwood , a fine gravel or sandy substrate, some smooth river rock, good filtration, and minimal water flow. 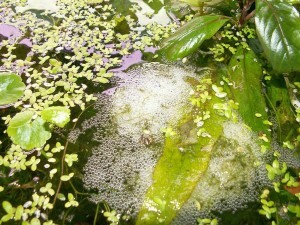 Some floating plants can be added for species that are bubble nest builders or that thrive in low light conditions. 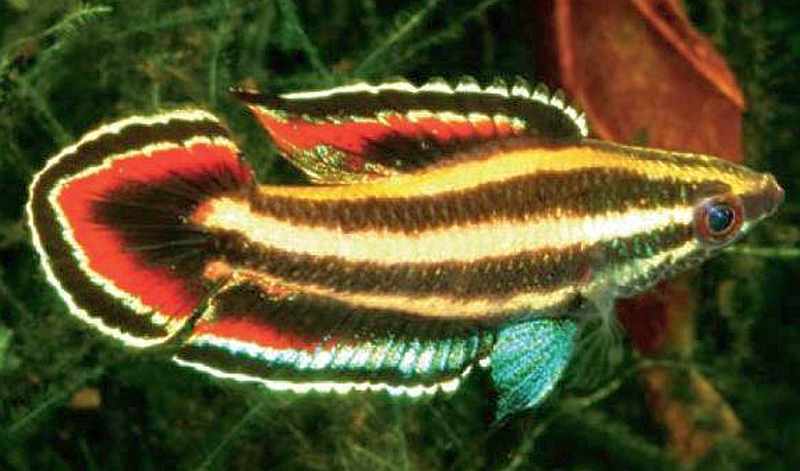 Always allow some head space in a tank with labyrinth fish so they can gulp atmospheric oxygen when needed. Most Gourami are omnivores, and although they will eagerly east most prepared foods, they should be fed a varied diet to promote their development and enhance their gorgeous colors. 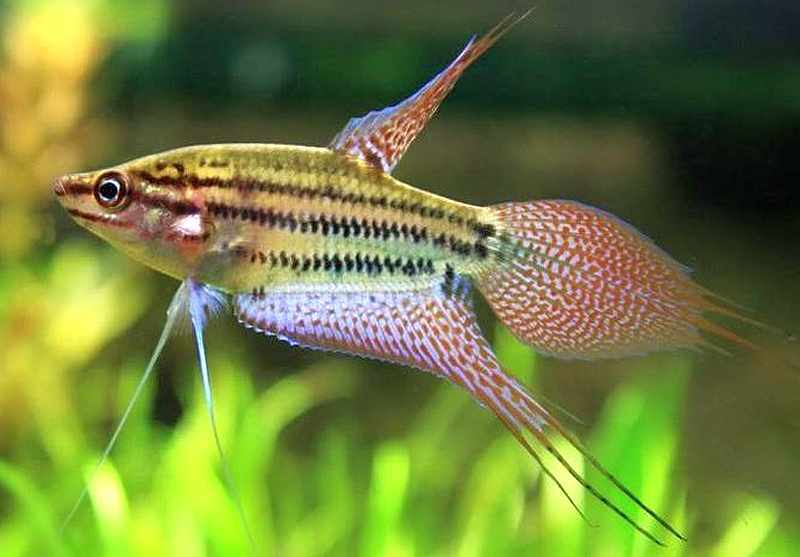 They do best on a quality omnivore flake food diet supplemented with fresh, frozen, or freeze dried brine shrimp, bloodworms , tubifex , mosquito larvae, and occasional offerings of fresh vegetable matter such as mashed peas, lettuce, or prepared algae wafers. Most Gourami can be easily bred in an aquarium environment. Many are bubble nest builders like the Betta splendens, and some are mouth brooders but all species show some form of parental care. Breeding bubble nest builders is best accomplished in a separate breeding tank that has a tight fitting cover to maintain a high humidity level. 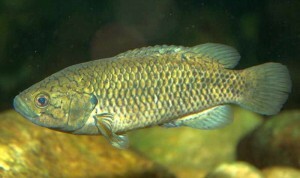 The size of the tank is dependent on the species being bred. 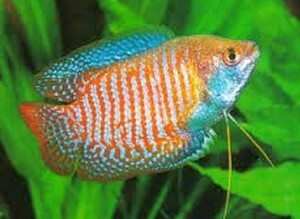 A 10 to 15 gallon tank is ideal for dwarf Gourami, while a 25 to 40 gallon tank is better for larger size fish. The water level in the aquarium should be about 4 to 5 inches deep and the water temperature held at 86 to 90 degrees F. There should be no filtration or air movement in the aquarium and because bubble nest builders use plant material in the construction of their nests, it is essential to have some floating plants in the tank. Ceratopteris thalictroides, Limnophila aquatica, Riccia fluitans, and Vesicularia dubyana are excellent choices. Condition the pair by feeding them freeze dried Tubifex, Daphnia, bloodworms and live or frozen brine shrimp. 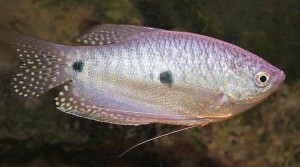 When the pair is ready to breed the male will begin building a bubble nest on the surface and on the underside of the floating vegetation in the tank. 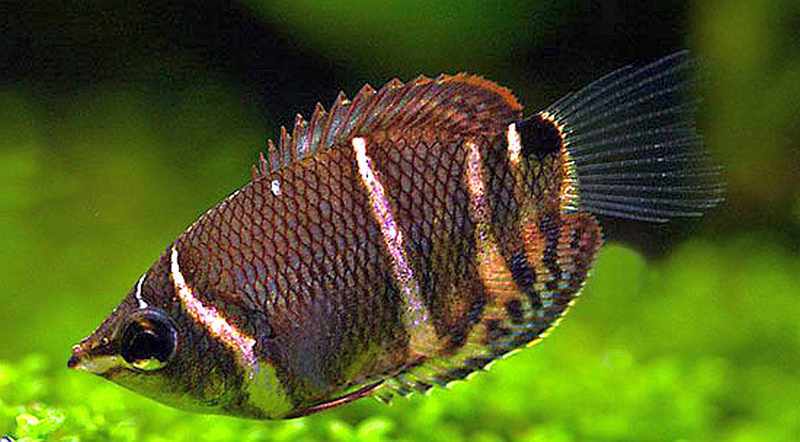 If you have condensation dripping from the tank cover back into the aquarium, the high humidity conditions are perfect for raising the fry which are highly susceptible to chilling of their labyrinth organ. When the bubble nest is completed, the male will start courting the female, usually towards the evening hours, trying to draw her under the bubble nest. During the courting display the male typically swims around the female with flared fins until the female accepts his invitation to spawn. The pair will swim around together in circles under the nest until ready to spawn. 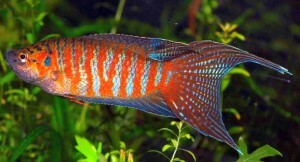 She will then touch the male on the tail or his back with her mouth until he embraces the female by turning her on her side and then onto her back. 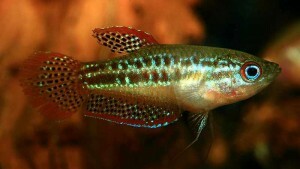 The female will then release up to 60 eggs which are immediately fertilized by the male. Most of the eggs will float up into the bubble nest but the male will quickly collect any stray eggs and place them there. When all the eggs are secure in the nest, the pair will spawn again repeating the process until all the eggs are laid. Depending on the species, males will spawn with several females in the same nest and the amount of eggs laid can vary from 2000 plus for a single Pearl Gourami female to less than 100 total for a Sparkling Gourami. 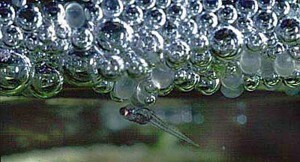 When the spawning is finished, the male will place a layer of bubbles underneath the eggs already in the nest. 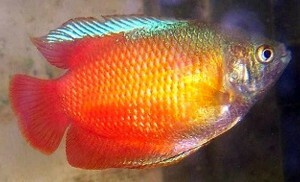 At this time the female or females should be removed from the tank (for her protection). The male will aggressively defending the eggs in the nest and the surrounding territory from any real or imaginary foes until they hatch (in 12 to 24 hours). 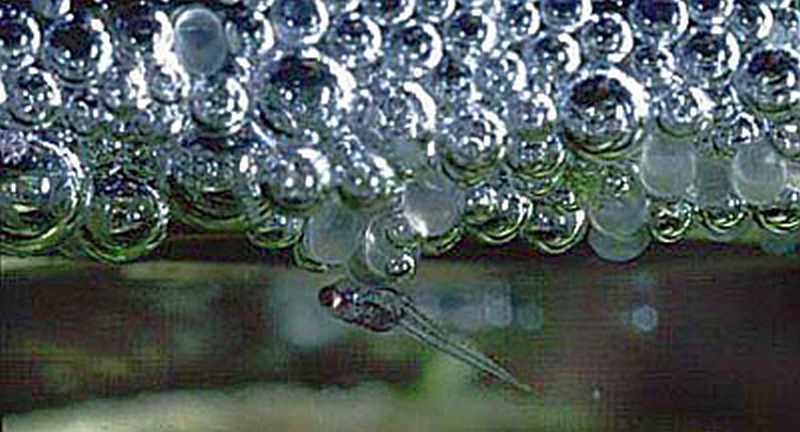 The male will tend to the fry and keep them in the bubble nest until they develop (in about two days) from tiny black spots to little “wrigglers” with their tiny tails hanging out of the nest. 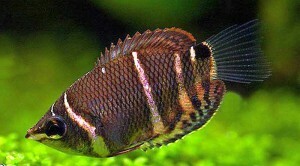 The male will continue to care for the nest and catch any displaced fry by blowing them back into the bubbles. 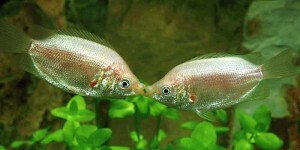 This is why the water level is lowered in the breeding tank. 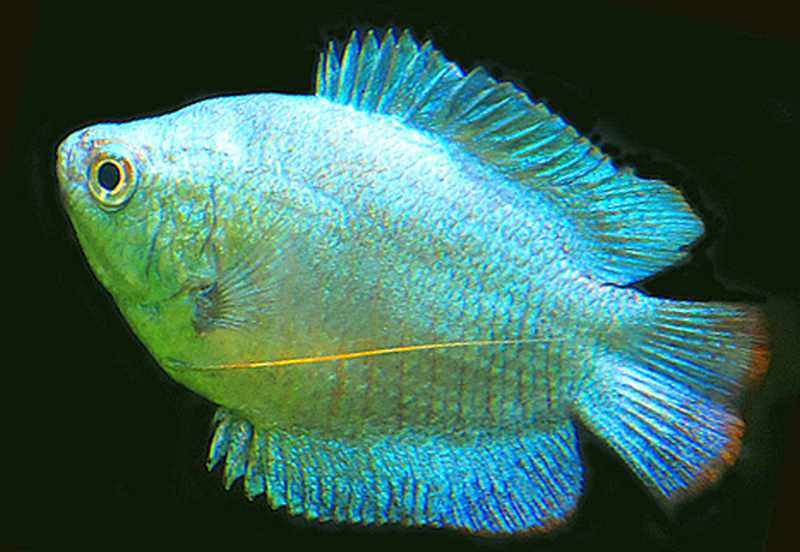 In the wild, gourami live in very shallow water with thick vegetation, and when the fry fall out of the bubble nest, the male can easily scoop them up and return them to safety. The thick grass vegetation anchors the nest and keeps the bubbles together. After 3 to 4 days the fry should be free swimming and begin leaving the nest in mass. At this stage, the male should also be removed or he may consider them food. Feed the fry infusoria or a liquid fry food until they are able to consume newly hatched baby brine shrimp and finely crushed flake food. 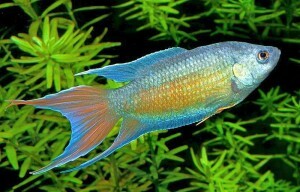 Avoid making any water changes for the first month or so, and then change only 10% of the water per week. The fry are extremely delicate and regardless of how good a job you do, a large spawning of several hindered fry will yield only 20 to 30 young gourami.